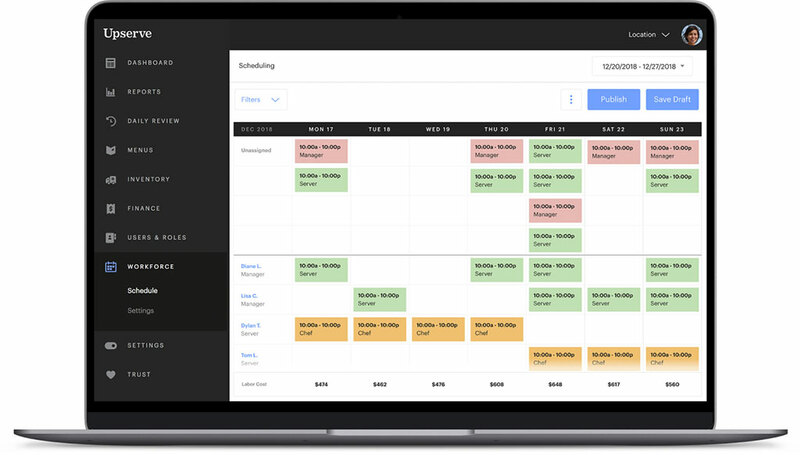 You can create schedules within a simple calendar view to create and assign shifts from scratch or work from an existing template. Schedules can be shared with employees by text and/or email. Enable time-clock enforcement with an optional grace period to require manager approval if employee clocks-in too early. Upserve Workforce is easy to use and eliminates the need to manage an additional vendor since Workforce is already built into the Upserve Platform at no additional cost. Upserve Workforce is suited for full-service, quick-service, and multi-location restaurants that need to create and share schedules with their employees. Workforce integrates by syncing existing employee information and allowing you to create schedules right on the Upserve platform. This allows restaurants to create and send schedules on the same system where all your data lives. By also integrating with your POS, you will be able to enable clock-in enforcement.